A person who sees the current Stratford production of Shakespeare's Henry VI plays might well come away thinking that indeed these are "lesser" works and not be surprised they are done so infrequently. That would be sad mistake, for in the right directorial hands and with the right company these plays combined with "Richard III" to make up Shakespeare's First Tetralogy can be exciting, absolutely riveting theatre. This is only the third time in its 50 years that Stratford has deigned to do these plays. The last time was Pam Brighton's production back in 1980 when all three parts of "Henry VI" were squished together into a three-hour play and featured several truly awful performances. The present production by Leon Rubin is far superior to Brighton's but shows little understanding of the themes of the play or its structure. Between when Stratford last did the Henry VI plays and now, I've seen three further productions of them, two by the RSC and one by Drama Department at Berkeley, all of which were better conceived and executed that the present production. Last year the RSC visited Ann Arbor, Michigan, with Michael Boyd's acclaimed production of the First Tetralogy, the first time the RSC had ever done each of the plays separately and uncut. "Henry VI, Part 1" ran to three hours, Part 2 to three hours and a half hours, Part 3 to three hours and forty-five minutes and "Richard III" to four hours. The production was a revelation because it proved that the more of these plays is presented the most fascinating they are. The entire sequence is governed by recurring patterns of action and image which not unlike Wagner's leitmotifs, gain in significance with every repetition. Radical or insensitive cutting ruins these patterns and their cumulative force. Stratford has combine both parts of "Henry VI" into one play subtitled "Revenge in France" lasting three hours. Henry VI, Part 3" is subtitled "Revolt in England" and lasts only two and half hours. Compare these timings with those at Ann Arbor and it becomes obvious how little of the Henry VI plays Stratford is actually performing. No one can judge their real power when seen in such a butchered form. Last year when Stratford did the two "Henry IV" plays and "Henry V" casting was continuous from play to play. This year, even though Stratford has given three "Henry VI" plays and "Richard III" the title "The Wars of the Roses", it has not used continuous casting eve though many of the same actors also appear in "Richard III". The future Richard III who has his first major soliloquies in "Henry VI, Part 3" is played by a different actor in "Richard III". Likewise, Seana McKenna who plays Margaret of Anjou in the "Henry VI plays" shifts to the role of Queen Elizabeth. If Stratford were actually serious about presenting the First Tetralogy, it would present them as a unified group as has been done with so much success recently in England, the US, Germany and Italy. Leon Rubin, in first season directing at Stratford since 1984, has put "Henry VI, Parts 1 and 2" through a shredder, ruining the Shakespeare complex patterning of events. He has shifted the events in France primarily to Act 1 of "Revenge in France" focussing on Joan of Arc and moved the events in England to Act 2. Joan of Arc may be the best-known character in the "Henry VI" plays to a modern audience, but in Shakespeare time she was merely a witch who the fickle French blindly followed to their doom. The real focus of the "Henry VI, Part 1" should be Talbot and his son, who become the first victims of rivalry between York and Lancaster. Shakespeare shifts rapidly between scenes in England and France to show the French coming together as the English fall apart. Rubin's cutting loses all of this. Unlike the two RSC productions he does not have the same actress play both Joan and Margaret (as would have happened in the original). The symbolism is thus lost that the English have defeated one French witch only to invite another into England itself. Rubin has the good idea of having Seana McKenna, the Chorus in last year's "Henry V", repeat that play's closing lines referring to the "Henry VI" plays. But then he cuts the important scene near the end of "Revolt" when Henry VI in prison meets young Richmond (the future Henry VII) and prophesies the victory we will at the end of "Richard III". Rubin's direction has little to do with illuminating the text. Rather stages most of the dialogue in a static fashion as we works up to visual effects that call attention to themselves more that Shakespeare's ideas. In "Revenge" Duke Humphrey's wife is surprised while seeking advise from witches. Using an Eastern technique of reflected light and shadow puppets, Rubin makes clear that the witches are charlatans. We thus discount their prophesies contrary to Shakespeare's plan, who has structured the plays through a series of curses and prophesies, demonstrates that every one comes true. In "Revolt" Rubin has decided that Henry VI must fall from a height when the future Richard III stabs him. To engineer this, Rubin has a large bed, poorly disguised as a table, moved on long before the stabbing. It is so high that it obscures much important action played upstage like Margaret's reaction to her son's murder. When Henry falls, the result is merely decorative and not worth the awkward set-up. More peculiar is the decision to have what looks like a robot wander the upper runway during the final battle. I assume this ugly creature is supposed to be Death, but it opens up to reveal Michelle Giroux inside. Is the struggle between York and Lancaster supposed to be Joan's revenge on England? If so, Rubin has completely misread the plays. The stage is dominated by an industrial metal scaffold that provides a narrow acting runway above the stage. Designer John Pennoyer claims in the programme that this "allows more action and a swift interchange of location". In theory that might be true, but in practice Rubin rarely uses it that way. This structure is a major disadvantage for people seating in the front two or three rows who then have to crane their necks to see what's happening on the second level. The structure also disrupts movement on stage since Rubin seldom has action circulate around and through it. Pennoyer's costume, however, are quite attractive and make reference to styles from the Middle Ages to Shakespeare's day. The one oddity is in outfitting Joan of Arc as a samurai warrior. John A. Williams's lighting seems to have only three settings-on, dim and off, while Michael Viera's music, veering from world beat to film fright music is seldom suits the action. John Stead has given great variety to the many fight scenes. The cast of 30 is headed by Seana McKenna as Margaret and Michael Therriault as Henry VI, the only two characters who appear in all four plays. Henry VI is an unusual character, a boy-king, son of the hero Henry V, whose piety and pacifism make him unsuited to govern a country faced war abroad and civil war within. Yet he is also the moral centre of the play. The action ultimately bears out his view that in the grand scheme of things earthly power is mere vanity. Since he is primarily a passive character, an actor has to be able to communicate an inner strength of spirit that makes the power-seekers around him appear vicious and benighted. This is extremely difficult but it can be done. I saw Ralph Fiennes do it in London in 1989 and David Oyelowo in an award-winning performance in Ann Arbor in 2001. While Therriault is good at showing the youthful naiveté of the boy-king in "Revenge", he simply can't muster enough moral authority in "Revolt" to prevent the saintly king from becoming a laughing-stock. Margaret is probably Shakespeare's greatest female character. We see her move from a not-so-naïve 17-year-old in "Henry VI, Part 1" to a mad old woman in "Richard III". Margaret comes to England at the behest of Suffolk to be the king's wife and his own mistress. When Suffolk is killed and she sees the passive nature of her husband, she takes matters into her own hands to lead the Lancastrian forces against the Yorkists. Since the king will not fight, she must. And she fights for power because without it she will be nothing. McKenna is excellent in "Revenge" gradually transforming herself from a seemingly lightheaded teenager to woman fully aware of her perilous situation and driven over the edge by the death of her lover. In "Revolt", however, she never musters a sufficient sense of rage and desperation to live up to York's famous description of her as "a tiger's heart wrapped in a woman's hide". Far too often she relies merely on derisive intonation to characterize Margaret rather than making her the demon incarnate that I've seen elsewhere. Only two other actors have a major role that continues through "Revenge" and "Revolt". Deep-voiced Thom Marriott makes Richard, Duke of York, the most powerful of the plays' many tragic figures. His Richard is an opportunist who sees in the weak king a chance to restore the York line to the throne. By making Richard's ambition seem so natural, he makes his humiliation at the hands of Margaret all the more painful and all the more moving. Donald Carrier's tendency to bluster for once suits the character of Warwick, who enjoys his own ability to make and unmake kings. Carrier makes believable Warwick's obliviousness to twice switching sides in the civil war. Jonathan Goad has major roles in both sections. In "Revenge" he is Suffolk, the lascivious schemer who brings woos Margaret on his own behalf. In "Revolt" he is Jack Cade, the illiterate leader of a peasants' rebellion. While he clearly distinguishes the slick Suffolk from the unkempt Cade, he is more successful at the insinuations of the former than in conjuring up the menace of the latter. His Cade is more a buffoon that the truly frightening character he can be. Brad Rudy shouts his way through the role of Talbot making the English hero seem more rough-and-ready than noble. Rudy is much better and more modulated as Buckingham. Jason Mitchell doesn't bother to distinguish Charles the Dauphin in "Revenge" from Lewis XI, King of France, in "Revolt". Of actors with principal role in "Revenge", Michelle Giroux gives us a bizarre characterization of Joan la Pucelle (Joan of Arc) as a fashion model. Pacing as if on a catwalk and speaking in a totally artificial style, she suggests neither Joan the peasant girl, the visionary or the warrior. Robert King (replacing Lewis Gordon) plays the impious Bishop (later Cardinal) of Winchester as if he were an inn-keeper losing all subtlety in signalling his slyness with nudges and winks. Jane Spence is good when she is the vain Duchess of Gloucester but doesn't have the resources to convey her utter shame in the scene of her repentance. David Francis is excellent as the Duke Humphrey, a good man who doesn't realize that his protectorship of Henry VI and his wife's ambition will be his undoing. Veteran actor William Needles has only one scene as the dying Mortimer, who passes his claim to the throne to Richard, Duke of York. His performance is a model of clarity and emotion which much the cast should study. Of actors with principal roles in "Revolt", Haysam Kadri is suitably menacing as the future Ricahrd III. I overheard people say they'd like to see him continue in the role in that play. Rami Posner captures the lustfulness and empty-headedness of Richard's brother, Edward IV, but there is far more to the role than that. Twelve-year-old Andrew Dodd as the Prince of Wales, put much of the cast to shame with his clear diction and sense of poise. Michael Schultz (Burgundy, Lord Say, Oxford and Iden) and Tara Hughes (Lady Bona). The many other players put in work ranging from poor to merely adequate. The main reason to see the "Henry VI" plays is that if Stratford follows its past pattern they make not reappear for another 22 years. Anyone who saw the RSC do the First Tetralogy last April at Ann Arbor should feel no need to see the Stratford production which in conception and execution looks high-schoolish by comparison. The RSC has agreed to visit Ann Arbor every other year. Ann Arbor is only four hours from Stratford. People are bound to make comparisons. Unless Stratford radically increases its commitment to Shakespeare by assigning his plays, famous or not, to its best actors and most knowledgeable directors, Stratford's claim to produce Shakespeare equal with the world's best will lose credibility. 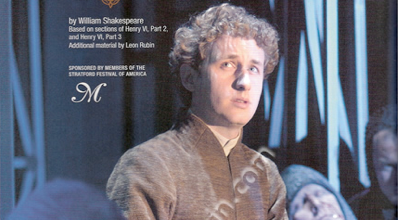 Photo: Michael Therriault as Henry VI on cover of Stratford Festival programme.. ©2002 Stratford Festival.